In 2013 Oyster Pond, in the Quisset area of Woods Hole, was at risk from overloading of nitrogen from septic systems and fertilizer runoff. Fed by both ground water and runoff, the Pond was home to one of the largest herring runs in Falmouth as well as white perch and imperiled American eel. It was estimated at the time that 65 percent of the nitrogen load would have to be removed to return Oyster Pond to a healthy condition, and the Town was developing a Wastewater Management Plan to use in reducing and limiting the excess nitrogen polluting the Pond. There was an additional significant risk posed by potential development of 21.92 acres of undeveloped land in the Oyster Pond watershed, the last remaining undeveloped large parcel in the watershed. Pollutants from this property enter the groundwater, which seeps into the wetland system and flows under Ransom Road directly into Oyster Pond. 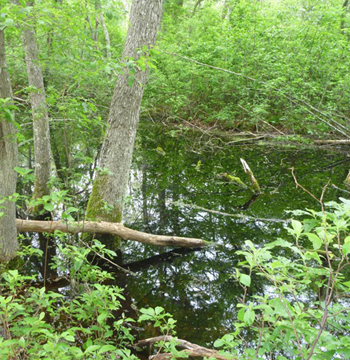 Called the Jannasch parcel and owned by the Woods Hole Oceanographic Institute, the property features woodlands and wetlands as well as possible vernal pools. It was estimated that a 40B housing complex or up to seventy housing units could be built on the subdivided property. The additional pollution from septic system flow and storm water runoff would devastate the already stressed water in Oyster Pond. In October 2015, the Oyster Pond Environmental Trust (OPET) purchased the Jannasch parcel for $2.1 million using a combination of public and private funding sources including $250,000 in CPFunds that were used to purchase a conservation restriction to be held by the Conservation Commission. The conservation restriction conserves the acres as permanent open space within the Oyster Pond watershed. It protects a significant water resource and wetland habitat. Creating a linked area of 34 acres, the property provides a bridge between Zinn Park and Spohr Gardens, preserves the heavily used informal walking path that connects Fells and Ransom roads, and offers opportunities for passive recreation. It also helps maintain the beauty and integrity of the Shining Sea Bikeway. The cost of the purchase, including the conservation restriction held by the Town, was $2.1 million. OPET drew on private donations from 180 individuals for $890,000 of the cost. In addition to the $250,000 from the CPFund, the Department of Conservation and Recreation awarded OPET $500,000 as a Landscape Partnership through the Environmental Bond Bill. Foundations contributed $357,500 and four Land Trusts contributed a total of $102,500. By 2013, it was estimated that approximately 21 percent, or 5,838 acres, of the Town’s land area had been set aside as open space, and the purchase of the Jannasch property hastened the Town’s progress toward the its stated goal in its Local Comprehensive Plan of protecting 30 percent of Falmouth’s land area as open space.